Pairs of hooded mergansers appear on Mill Pond and other ponds in town during their spring migration northward. These small diving ducks are named for their "hood," a large, fan-shaped crest of feathers. Here, a male sports his bold, geometrically patterned black-and-white hood, which is part of his dramatic breeding plumage. Wild ducks on Westborough's ponds are a sure sign of spring once winter's ice gives way to open water. Many wild ducks, such as the dramatic-looking hooded mergansers (Lophodytes cucullatus), are shy. They stay out in of the middle of ponds where they feel safe. This habit makes binoculars helpful if you want a good look at them. Even from a distance, you can often pick out hooded mergansers by the way they act. They are small, but they swim fast – more quickly than the other ducks out there – and they dive. Now you see them, and now you don't! They dart under water and pop up in a different place. In contrast, the female, has a dull-colored hood and other drab feathers that camouflage her year-round. 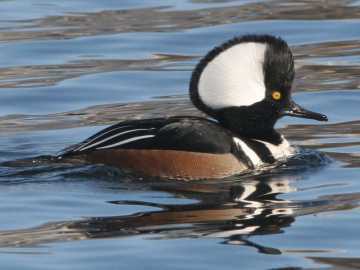 A hooded merganser's dive is really a fishing expedition. These ducks eat fish, as well as frogs, crayfish, snails, and various insects. If a dive is successful, the hooded merganser comes up with a fish and spends a few moments tossing the fish in its bill and swallowing it whole. Hooded mergansers are well built for diving and fishing. Their legs are set back near their tails, where they enable the ducks to dive and swim powerfully under water. Their bills are long and thin, with serrated edges for gripping slippery fish and other live prey. These ducks spot their prey by looking into the water before diving. During a dive, their clear "third eyelid" protects their eyes underwater, like goggles. At this time of year hooded mergansers are often in pairs or small groups. A few may stay in our area, but most of them are probably on the way to other places farther north to breed. Westborough's many ponds and swamps make good stopping places for many kinds of wild ducks during their spring migration. The trails around the ponds in town offer vantage points for looking for wild ducks. Sandra Pond (Bowman Conservation Area, Minuteman Park), Mill Pond (Headwaters Conservation Area, the Malley Trail, Arch Street), and Lake Chauncy can all be good places to look. And don't forget to check the small, shallow, wooded ponds that you might encounter along various Charm Bracelet trails. If you get a good view of some hooded mergansers, you'll see that both males and females have a fan-like crest of feathers on their head – the "hood" that gives them their name. The ducks can move the fan, spreading it wide or collapsing it flatter. At this time of year, the males are easy to spot. They're decked out in their fancy breeding plumage, with bold geometric black and white patterns. And being spotted is the whole idea. The males are all dressed up to get the females' attention. And where are the females? The females are much less conspicuous in drab gray and brown plumage. They blend right into their surroundings. That, too, is the idea. The females get to pick a male of their choice, often from among several. Later the females care for the pair's eggs and raise a brood of ducklings, alone, in the safety of their camouflage. Hooded mergansers usually pair up in early winter, during their migration, and stay together for the breeding season. Once the female starts to sit on eggs, the male promptly leaves. His fancy plumage disappears for the summer months, in response to changing hormone levels. In the fall, at migration time, it returns. Hooded mergansers nest in holes in trees, usually at least several feet up. They prefer wooded areas near a pond or swamp. Sometimes they use the nest boxes that have been set out in ponds for wood ducks (Aix sponsa). After a hooded merganser's ducklings hatch, they all leave the nest together within 24 hours. They jump down from the nest hole to follow their mother. They can walk and swim, but they don't fly for another two months or so. A century ago, hooded mergansers were overhunted, but that is no longer the case. Today cause for concern comes from the potential loss or degradation of their habitat. Hooded mergansers and other migrating waterfowl give us reasons not only to preserve Westborough's natural areas but also to care for our larger environment. Hooded mergansers need clear waters so they can see to fish . Nearby they need quiet woods areas with dead trees so they can find nest holes. Agricultural practices, development, and forestry practices can lead to waters clouded with sediments, as well as to loss of woods and dead trees. Acid rain makes ponds more acidic, often reducing the numbers of insects and other small creatures that feed the hooded mergansers' ducklings. 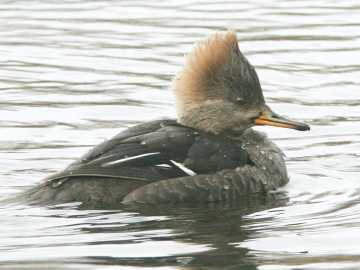 In addition, mercury – from a diet of fish – can approach harmful levels in hooded mergansers' bodies.